Last week was “youth Sunday” at my church. Six young people, including my twelve-year-old daughter, led the service with a confident and fresh spirit. A bit surprisingly, the sanctuary was full; but that’s because this church loves its youth. It was a treat to be led by their witness, their invitation, and their enthusiasm for their community and for Jesus. They led prayers, corralled the younger ones for the children’s moment, selected songs and hymns, helped with communion, and even preached the Word. The kids’ reflections were precious and powerful. One admitted she was frustrated that Jesus kept asking Peter the same question over and over, even though he answered it already. It felt a bit too much like the way parents speak to children, she thought! She made the connection to Peter’s thrice betray of Jesus; maybe he needed to say he loved Jesus three times to make up for it. Another youth didn’t really like being compared to sheep. “Do you know how smelly sheep are?” he asked. But then he realized that Jesus was asking us to love others even when it’s hard. My daughter reflected on the verses in which Jesus tells Peter how he will die. A secondary theme to the worship service was the fiftieth anniversary of the Children’s Crusade, led by Martin Luther King Jr. in 1963. She spoke about how you need courage to follow Jesus, like the young people in the Children’s Crusade needed courage to speak out against racism. Beautiful! Listening to the young people comment on Jesus’ word to the disciples, I was reminded how practical and down-to-earth youth can be. And indeed, isn’t that what Jesus is doing in this final chapter of John’s gospel—giving some very practical instruction to the disciples whom he will leave soon. Feed my lambs, tend my sheep, feed my sheep, and follow me, he says. One commentator on this passage suggests that John 21 is the fulfillment of John 17, the earlier chapter in which Jesus prayers for his disciples. It’s a three-fold prayer. In the first movement of the prayer, Jesus prays for himself, that he be glorified in God’s presence as a witness to the disciples. In the second movement Jesus prays directly for the disciples. “I am asking on their behalf … All mine are yours, and yours are mine. … Protect them in your name that you have given me, so that they may be one, as we are one.” In the final movement, Jesus asks that the disciples be empowered to care for “those who will believe in me through their word, that they may all be one. As you are in me, and I am in you, may they also be in us, so that the world may believe that you have sent me.” He prays for the world. At the end of John’s gospel, after the risen Christ has appeared several times, he comes one more time to the disciples and beckons them to serve the world, not just follow Jesus for their own benefit. But rather be one with Jesus in order to serve the world—tend the lambs, feed the hungry, visit the prisoners, free the oppressed, and bring good news to the poor and recovery of sight to the blind. At the end of the gospel just before he leaves them, he tells them how to live out the prayer he has for them. In worship last Sunday, aglow with authenticity and enthusiasm, the young people in my church awoke our imaginations and filled our hearts with love and inspiration to follow Jesus and make the world a better place. That’s a good Sunday. I’ll be back for more. 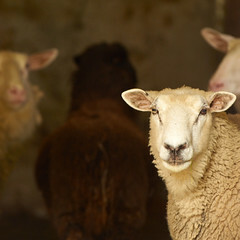 The image displayed in this post is "sheeps by staflo, on Flickr" and is used in accordance with Creative Commons licensing. Verity A. Jones is the executive director of the Center for Pastoral Excellence at Christian Theological Seminary.